Alternative energy is the name given to any type of energy used to replace a different source of energy, often because of the negative consequences of its use. Types of alternative energy throughout history have included coal, petroleum and alcohol. In the 21st century, these alternative sources have included bioenergy and biofuels such as palm oil, ethanol, and other low carbon alternatives. In the Middle Ages and Renaissance period from the 1200s to the 1500s, coal was used as the first source of alternative energy. When forests began to disappear due to the significant need for wood in any ever-modernizing world, coal was introduced as an alternative. Three hundred years later, in the early 1800s, petroleum was used to replace the depleted source of whale oil for fuel lamps. In the early 1900s, the concern over the quickening use of coal and oil around the world led some to seek alternative energy sources for these precious fuels. Inventor Alexander Graham Bell first proposed using corn-based ethanol oil in 1917. These reusable energy sources came into use in the 1950s and 1960s, most notably in the United States and Brazil. In 2008, these were the top two ethanol oil users in the world. Brazil, in 2008, had over 35,000 stations that offered ethanol fuel in addition to gasoline. 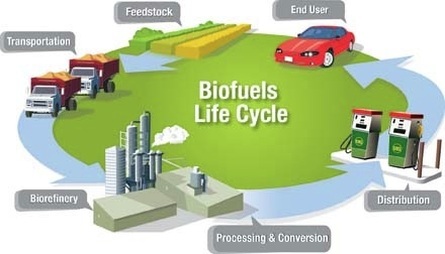 In the 2000s, different biomass sources were introduced as another alternative to harmful fossil fuels, composed of recently deceased organic matter. Other recent sources have included zero carbon alternatives with low methane emissions, such as hydrogen and nuclear power. Alternatives for transportation energy have been one of the most studied venues for alternative energy in the United States and around the world. With rising gas prices, many options are emerging as substitutes for gasoline, including previously mentioned ethanol fuels. Other sources have included electric and hybrid vehicles, as well as fuel cells and fly wheels. In recent history, the use of the term alternative energy has spurred controversy among some energy suppliers and manufacturers. A term that allows for government incentives, some have fought to include fossil fuels and nuclear energy as sources of alternative energy. Others have argued, however, that the negative consequences of theses sources – their high carbon dioxide emissions – exclude them from the category. In the eyes of many, alternative energy sources are meant to combat negative energy problems, and these create more by contributing to global warming.